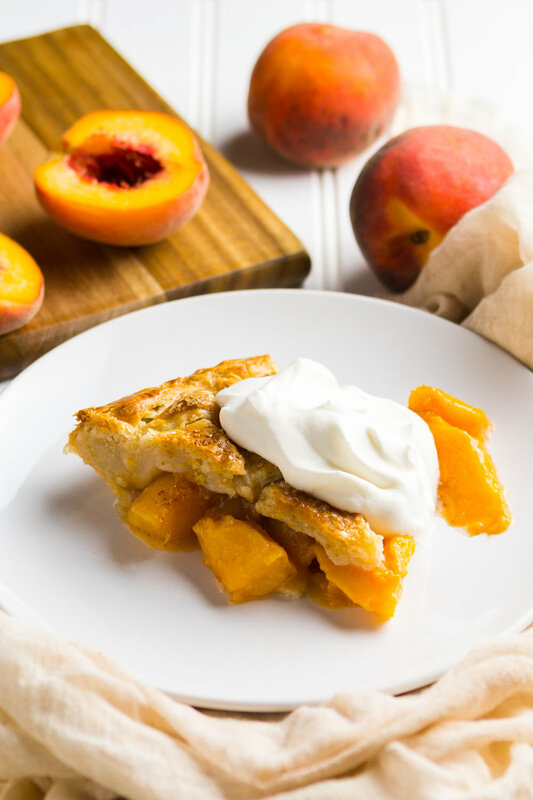 Classic Peach Pie — knead. bake. cook. I have made more pies this summer than ever before and tried making some new ones including this one and this blackberry crumble pie. Usually I end up making random fruit pies because I have several different kinds of fruits that I want to use up. In both of these cases, I had just enough to make a single fruit pie and they were gobbled up by my friends and coworkers. I was inspired by Zoë François to make a good ol' Classic Peach Pie and work on my lattice crust skills since it has been a while. Zoë has a variety of baking tutorials on her Instagram that make complicated baked goods seem approachable and friendly. I also like how her food photography is minimal and truly aims to highlight whatever dessert she is making. She has a method of thickening summer fruit pies in a way that helps with soggy bottom crust issues. Since fresh summer fruit is so juicy, it has a higher chance of creating a more liquid-y filling. The solution for this is to let the fruit drain and then thicken the remaining liquid over the stovetop with cornstarch. The sauce may seem way too thick at that point, almost gooey and gloopy, but when it goes into the pie, it helps to bind the filling together. I did this same method when I made the blackberry crumble pie and it really helped to ensure that it wasn't going to be pie soup. Those blackberries were so, so ripe. I am winding down on my summer list of pie-like things to make and it is sad to think that summer fruits will soon be gone. But, I know that fall is just around the corner, which is an even bigger excuse to keep on baking. For the past month, I have been feeling a burst of creative energy when it has come to making food, taking photographs and posting recipes. This is partly because earlier this month, I developed eight summer recipes for an Instagram Takeover with CAGROWN. I had a lot of fun with that and it made me want to continue to make more and more summery foods. These creative waves of energy come and go so I am hoping that it will keep on going for the rest of the year. In the meantime, there are a few more weeks of Ugly Fruit boxes so I'll be making as many stone fruit-filled desserts as I can. For the filling, place sliced peaches, brown sugar, lemon juice and salt in a colander over a large bowl. Mix to combine and allow to drain for at least 30 minutes or more if you can. In the meantime, roll out the bottom half of the pie crust and place it in the pie pan. 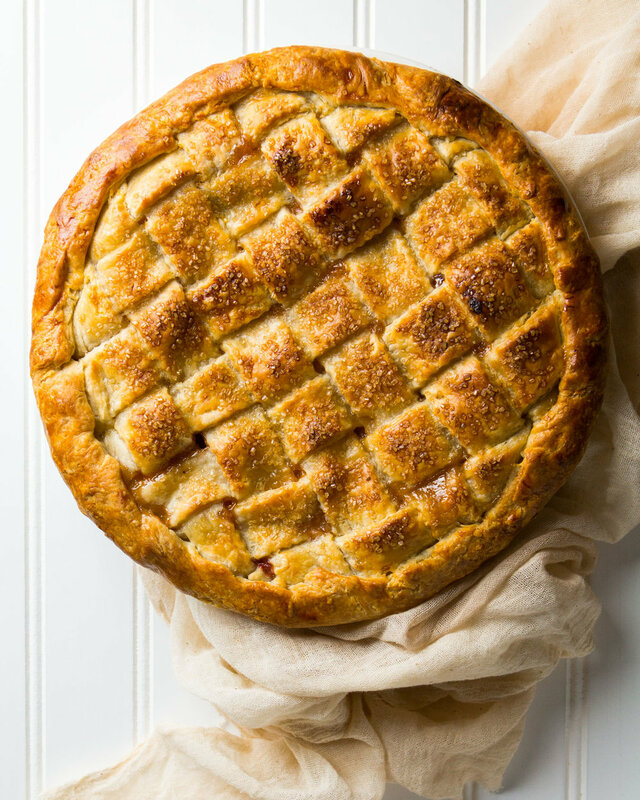 Roll out the second pie crust into an approximately 18-inch wide by 10-inch tall rectangle. Cut into 1-1¼-inch strips. Place on a baking sheet and chill with the pie pan in the fridge. 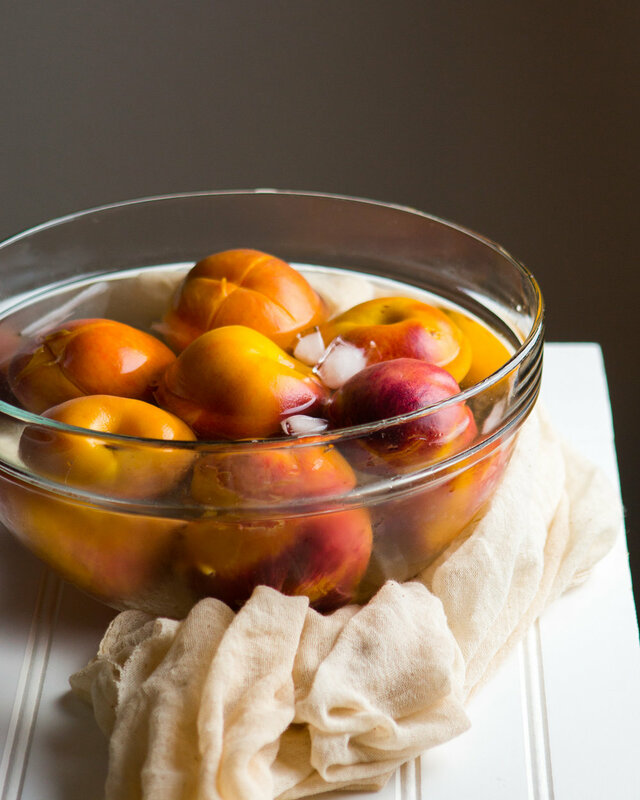 Once the peaches have drained, place juices in a small sauce pan. Sprinkle in cornstarch. Cook on medium heat, whisking constantly until liquid thickens significantly and becomes translucent. Set aside to cool and fold in with the drained peaches. Remove pie crust pan and baking sheet with lattice strips from the fridge. Pour filling into the pie pan. Smooth on top. You may have some extra filling which may create a domed top. I went for a flat top so I saved the extra fruit for a leftover pie (leftover filling + leftover pie crust bits). For the lattice, place half of the prepared dough strips side-by-side on top of the filling. Fold every other strip back, then place a dough strip in the center. Unfold the strips you folded back over the center strip. Take the parallel strips that are underneath the center strip and fold every other one back over the center strip. Lay down another strip snugly next to the center strip. Unfold the parallel strips over the second strip. Repeat until all of the dough strips have been used. Trim off the excess lattice and fold the edges of the bottom crust up and over the lattice strips. Crimp the edges together. Slide the whole pie into the freezer until the crust is very firm, about 15 minutes, before baking. When ready to bake the pie, place it on a baking sheet to catch any drips. Beat the egg, then brush the top of the pie with egg wash and sprinkle with turbinado sugar. Bake for 30 minutes and then drop oven temperature to 350ºF. Bake for another 30-45 minutes or until the pie is a deep golden brown and the juices are clear and bubbling. If the crust begins to burn before the filling bubbles, tent it with aluminum foil. Cool for at least 2 hours before serving.